In the morning you will arrive in Paris, Charles de Gaulle airport where you will be met by our two vans. The first van will take your tandem or single bike, and cycling clothing and equipment, which hopefully you will have packed into a separate bag(s). The second van will take you and your overnight bag to your hotel in Paris. If you’re inclined to catch up on your sleep, your hotel facing an open square on a quiet side street in the heart of Paris, is ideal. On the other hand, since The Opera, The Madeleine, The Louvre, Place de la Concorde, Champs Elysees, and The Seine are all a short stroll away, you may be more inclined to enjoy the lights and life of Paris. My favorite Parisian cure for jet lag is to find a sidewalk café on the sunny side of the avenue, where I can sip my favorite beverage and watch the hustle and bustle of Parisian life. In the morning you will arrive in Paris, Charles de Gaulle airport where you will be met by our two vans. The first van will take your tandem or single bike, and cycling clothing and equipment, which hopefully you will have packed into a separate bag(s). The second van will take you and your overnight bag to your hotel in Paris. You can be sure that this Paris Accommodation will provide you with hours of comfortable and relaxing stay. This will help you regenerate energy for the upcoming exciting activities that you will do in your getaway here. If you're inclined to catch up on your sleep, your hotel facing an open square on a quiet side street in the heart of Paris, is ideal. On the other hand, since The Opera, The Madeleine, The Louvre, Place de la Concorde, Champs Elysees, and The Seine are all a short stroll away, you may be more inclined to enjoy the lights and life of Paris. My favorite Parisian cure for jet lag is to find a sidewalk café on the sunny side of the avenue, where I can sip my favorite beverage and watch the hustle and bustle of Parisian life. Paris, on a summer morning, is a wonderful experience and you will have all morning to bask in it. After lunch a van will be provided to take you from your hotel to the Gare de Lyon. Your train ticket, which will be waiting for you at your hotel, reserves you a seat aboard the TGV, which in French means “Train a Grand Vitesse”, or high speed train. Speeding through the French countryside, past fields and farms, Chateaux and rural villages, in an hour and 18 minutes you will be in the heart of France. 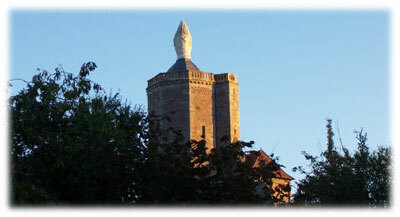 Arriving at Le Creusot, you will be met by your van and 25 minutes later you will be at your hotel in Autun. Having checked into your hotel, you will then have the afternoon to assemble and/or prepare your bikes, and to explore the town. The restaurant at your hotel, featuring regional fare, is a favorite of the locals, and there you will enjoy your welcoming dinner. Our first day of cycling will be an easy warm up day with a short but challenging ride in preparation for the days of riding ahead. This is a day to test the legs. We will leave Autun at 10 in the morning and explore some of the easier terrain. Along the way we will visit Roman churches, the Chateau de Sully, still the home of the Duchess of Magenta, and of course will be passing by some of the streams, small lakes, forests, fields, manor houses, and farms that will surprise and please us throughout the week. Lunch will be provided en route, and dinner will be in town at one of the many fine restaurants. This will be our first long day of cycling. We will be heading toward slightly hillier countryside, cycling down narrow roads, bordered by neatly trimmed hedges and practically free of cars. Exploring deep into rural Saone-et-Loire, around every corner will be a view of the heart of France that many visitors to France will never see. Our first long day, our goal will be one of the areas largest lakes. A picnic lunch will be delivered to you lakeside. Swimming is an option. 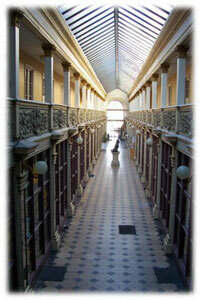 As with each day, you will return to Autun in time to “freshen-up”, and explore the town at your leisure. You can either enjoy a glass of "kir" (white wine with a few drops of black currant syrup, a specialty of Bourgogne) at one of the side-walk cafés, or you may choose to visit the local Museum, stroll through the medieval neighborhood, visit the many shops in the pedestrian shopping district, or visit the 12th century cathedral. For the more active guests, perhaps a swim in one of the two Olympic size pools at the aquatic center or, a walk along well maintained forest trails to visit a small waterfall and streams is more to your liking. Dinner this evening will be at one of Autun’s most respected small restaurants, just a brief stroll from the hotel. Today we will head again for slightly steeper terrain, and although the day will be longer, the exertion will be balanced for today we interrupt our ride through the loveliest countryside in France for a visit to the renowned archaeological dig at the pre-Roman village of Bibracte, and its accompanying museum. 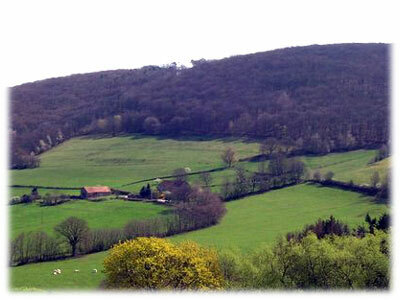 This renowned site dates from the late Iron Age. It was an active Celtic town whose population at one time reached 10,000. Julius Caesar spent the winter of 52-51 BC and wrote parts of his “Commentaries on the Gallic Wars” during that time. Bibracte was later largely abandoned when Augustundum (later Autun) was founded in the first century. Bibracte remained hidden on its hilltop until discovered in the late 19th century. We will have time to explore the digs and the museum. In the afternoon we complete the loop with a relatively easier afternoon ride back to Autun. Tonight you will be free to dine at a restaurant of your own choice. We recommend one of the many small establishments near the cathedral. At this time of year outdoor seating abounds and you will have many choices. Recommendations can be provided but in our experience, there are no bad choices. The more active of our guests may feel disappointed today, for there will be no riding. We hope however that we can provide adequate compensation with a full day spent visiting four of the region’s small vineyards. As wine tasting and bike riding may not be the best mix, we will travel by van. This will be a day to rest one’s legs, but also a day to explore the deep connection France has with the land. The vineyards we will visit are small, and off the beaten-track. 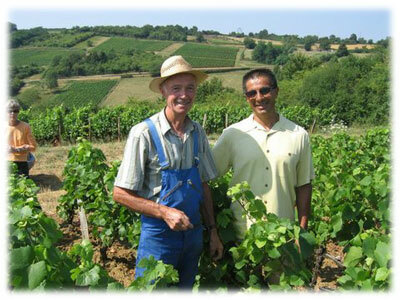 These are not the favorite vineyards of the tour bus operators but are among the favorites of the local connoisseurs. This day will conclude with dinner at a Michelin rated restaurant featuring delicacies of the region. Today we won’t be lounging, recovering from yesterday’s gastronomical explorations, but instead will head out on the longest ride of the week. We will make our way through the western edge of the Bourgogne vineyards and up to a plateau so large and so flat that the fields are more like the fields one finds in Northern France. As always, we will visit the many small surprises that the Bourgogne region provides. We will see a lonely, wonderfully carved roman column in a field (One can only imagine its purpose. Was it part of a larger edifice, or was it a memorial to a fallen Roman general? ), We will visit a lovely family owned castle, a medieval village which hangs on rocky cliffs much like Rocamadour its well known, touristy and larger sister in the Dordogne, and have lunch at a small village hotel. These are the sights to which most guide books will not take you. This day will start a little later than most in order to give you the time to visit a staple of small French towns, market day. 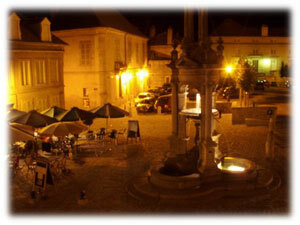 The Friday market in Autun is a wonder as a social, cultural and gastronomic experience that is not to be missed. If you are an aficionado of fresh farm produce, cheese, fresh baked bread, seafood, and more, take your time to savor the sounds and smells. After the market, we will head out again to explore new countryside. This will be your last day to see the countryside that few visitors to France will see. In autumn, the forests through which we will be riding are teaming with mushroom hunters – a favorite pastime of the Burgundians. We will stop halfway through the day at a hilltop auberge where lunch will be provided. Near the auberge is one of the area’s better known geographical formations, which includes a viewing post from which, on a good day, you can see hundreds of kilometers. In the evening you will have time to pack, and then wil enjoy our farewell dinner provided by our genial host at our hotel. Some of you may have planned a few extra days in France. For those of you leaving France, you will be taking an early morning train directly to Charles de Gaulle airport. Having spent the week with us, we hope that you will have had a more intimate experience with France than is possible with most bike tours. You will have experienced a week in the heart of a community and region and gained some insight into the rhythms of its daily life. We hope that you will be able to take a little bit of the favor of France home with you. All photos used with permission by Co-Motion Cycles Web Development: Wind's Eye Design, Inc.